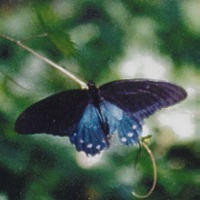 Pipevine swallowtails are Papilioninae butterflies. Their host plants are pipevines. 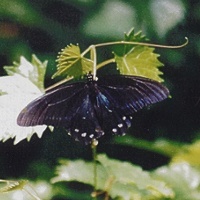 When perched, Pipevine Swallowtails look much like other swallowtails with the distinctive orange spots on the undersides of their wings. 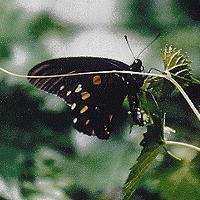 However, unlike other swallowtails, the uppersides of their wings typically appear dark. When the sunlight strikes them at the right angle, the blue iridescent scales make Pipevine Swallowtails easy to identify.